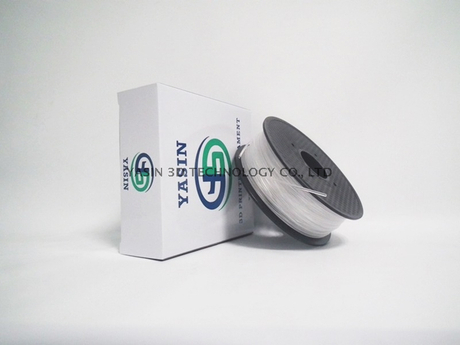 1.75mm/3.0mm 1kg Spool Natural Transparent Color PC 3D Filament - Buy pc filament, polycarbonate filament, pc filament natural Product on YASIN 3D Technology Co., Ltd.
1 Kg (2.2 lbs) spool of 1.75mm Natural PC filament. All filament is sealed in a bag with desiccant. Polycarbonate (PC)Filament is an extremely strong, impact resistant thermoplastic material which is widely used in automotive, aerospace, medical and many other areas. PC has great mechanical properties and heat resistance. 3D parts printed with PC are accurate, strong and durable. PC filament type has the second highest tensile strength among all FDM materials. The material is also biocompatible and can be sterilizable that is why it is so extremely popular for prototyping needs, functional testing, tooling and composite work. The material should be extruded at or above 300°C and high heat deflection temperature is 138°C. This material is malleable while cold and can be bent without cracking. Polycarbonate is available in 1.75mm and 3mm.  2015 YASIN 3D Technology Co., Ltd.